Things went from OK to good to great for Gardner-Edgerton in a matter of three minutes as the Trailblazers routed Shawnee Mission Northwest 49-27 on Thursday evening. It all started on a fourth and goal at the Gardner-Edgerton six-yard line. The Trailblazers brought pressure and forced Cougars quarterback Ty Black to get rid of the ball early. A Gardner-Edgerton defensive back was all over the receiver and the officials threw a flag on the play. After a brief conference amongst the referees, the flag was picked up and the Trailblazers took over on downs. After the game, Cougars coach Bo Black was told the receiver was behind the line of scrimmage, however, upon further review, he was in fact past the line. 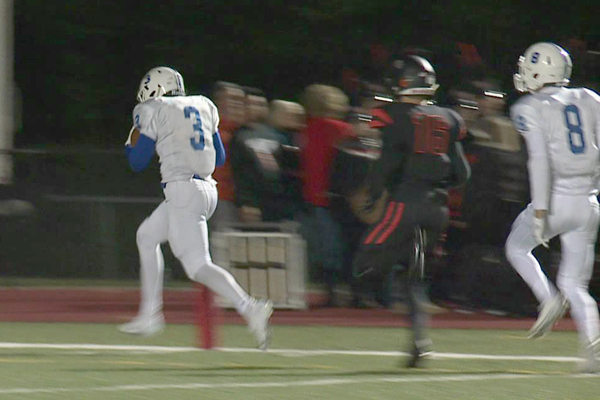 Six plays later, Luke Jennings went 59 yards untouched to give Gardner-Edgerton a 14-7 lead. On the play, the Trailblazers were flagged for taunting and the Cougars elected to have the penalty assessed on the ensuing kickoff. On the return, Shawnee Mission Northwest returned the ball into Trailblazers territory, but it was called back on a hold. Two plays later, Gage Gulley picked off a Ty Black screen and rumbled in for a pick six. The Trailblazers were in control. “It was (a) big (swing) until we let them score right there and they got back a little momentum there,” Gardner-Edgerton Ryan Cornelson said of the three-minute stretch at the end of the first half. “I told the kids they’re going to come out and they’re going to be extremely hyped up. Any time you’re undefeated, people are going to try and come at you. The Cougars did get six back right at the end of the first half as Ty Black was hit as he threw, but was able to complete the pass to Devin Talley, who went over a defender, bobbled the ball and then stretched out across the goal line before being brought down for a 35-yard touchdown. In the second half, Gardner-Edgerton rattled off 28 straight points to make it 49-13 as they got two touchdowns from Jennings and a score each from Anthony Rodriguez and Jacob Hunsperger. Both teams have high-stakes to play for next week. For the Cougars, they’re trying to guarantee a winning season. They’ll face Shawnee Mission South. For the Trailblazers, they’re looking to finish off an undefeated season and capture at least a share of the Sunflower League title when they take on Shawnee Mission West. It could be an outright title if Shawnee Mission East knocks off Free State on Friday night. The Trailblazers haven’t looked ahead to Week 8, but now they can. The Trailblazers have a chance to get the cheese.